Last Tuesday, the 20 November 2018, a parliamentary lunch took place in Brussels. 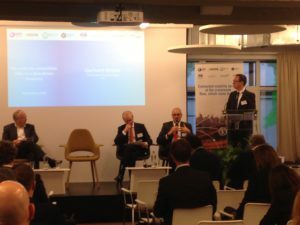 With the theme: “Connected mobility services at the crossroads – Now, which route to take?”, the meeting was organized by AFCAR and supported by CITA. 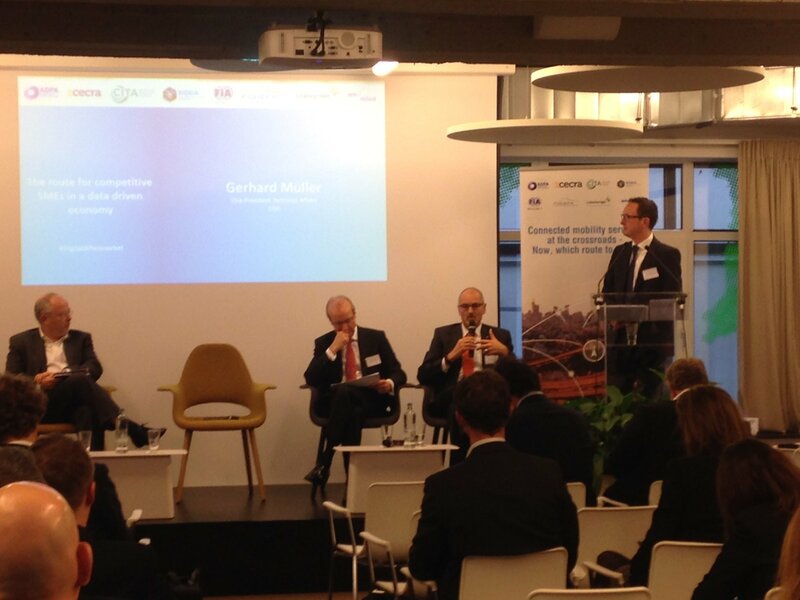 Beside Mr Gerhard Müller, CITA Vice President Technical Affairs, there to represent the interests of the inspection and testing bodies in the panel discussion, Wim van de Camp (MEP), Mr Eddy Hartog (DG CNECT) and Mr Bertin Martens (JRC) participated at the discussion. During the meeting was asserted that a free access to the original in-vehicle data for all stakeholder is a crucial precondition for a fair competition. Mr van de Camp, rapporteur for the Transport Committee’s own initiative report on autonomous driving in the EU, supported this postulation. Mr Hartog, responsible for the Recommendation on “5G, cybersecurity and data access framework” – mentioned within the 3rd Mobility Package and planned for next year – stated that the recommendation is important to ensure that a wide range of stakeholders, within the mobility sectors, will have the ability to evolve their business model into the digital age. Mr Martens introduced the JRC study regarding the business potential of data. A clear outcome was that the extended vehicle concept introduced by vehicle manufacturer is not able to guarantee fair competition. Mr Müller explained that, with the increasing technology, nowadays’s vehicles become much more complex, with a lot of electronic components and comprehensive software systems and algorithms. These modern vehicles require, in addition to a periodic inspection, a constant monitoring of the vehicle’s functions during the whole life cycle, with new test methods based on specific vehicle data. Therefore authorities and inspection bodies need a non-discriminated, independent and standardized access to original in-vehicle data for a valid type approval test, market surveillance test or PTI: the simple check of the latest approved software status will help to detect manipulation, which will become even more important with automated driving vehicles. All attending associations and representatives agreed that there is an urgent need for a regulatory framework regarding data access.